The formation of the Premier League from the 1992-93 season marked a major change in English football as the gap between the new top division and the rest of football quickly became a gulf. At a glance the first graphic below pretty much sums up what happened in financial terms. If you want more background on that, this linked piece from 2011 will explain in more detail. 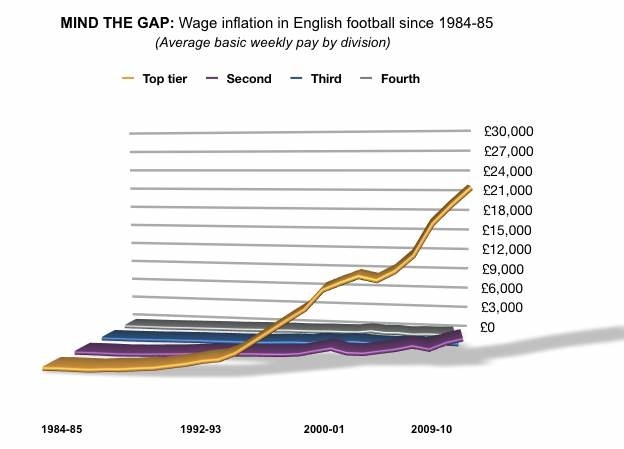 Suffice to say, when we talk about the ‘Premier League’ era, it is not because we think that’s when Sky TV invented the game, or because we think it only matters since then, but because the game changed fundamentally at that time – to become more and more dictated by money. The Premier League is the ‘monied era’ for good, or ill – and any Premier League VS The Rest comparisons should be seen in that context, not least in the FA Cup. 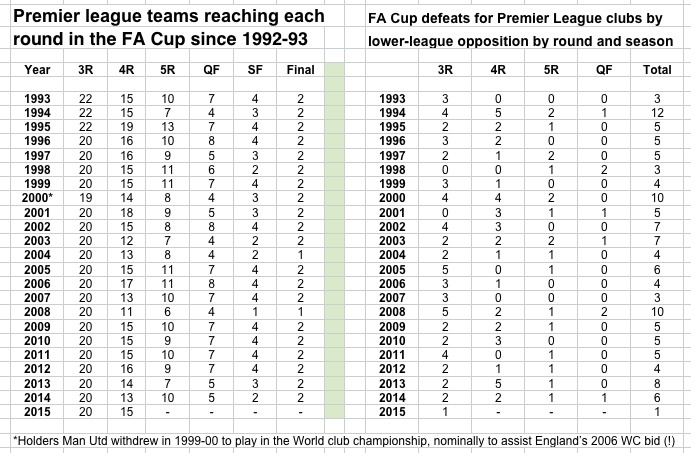 Thus within the context above, the Premier League team in the PL with the worst FA Cup record against ‘The Rest’ is arguably Liverpool. 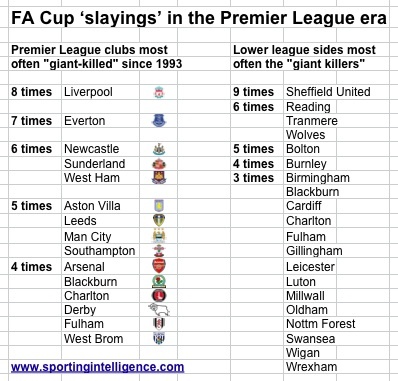 And the prime evidence in that argument is that Liverpool have been eliminated from the FA Cup by lower-league opponents more times in the Premier League era than any other PL team. It’s happened to them eight times since 1993, and perhaps even more worrying as they prepare to face lower-league opponents Bolton at Anfield this weekend, six of those previous eight defeats were at Anfield. Indeed in 1993 the victors were Bolton themselves at Anfield, in a third-round replay. Then in 1994 Liverpool lost to Bristol City at Anfield; then in 2000 to Blackburn, in 2003 to Crystal Palace, in 2005 to Burnley (at Burnley), in 2008 to Barnsley (at Anfield), in 2010 to Reading (at Anfield) and then two years ago to Oldham (away). Five Premier League clubs have been eliminated from the FA Cup this season already, but only one so far at the hands of lower league opposition: QPR, who lost to Sheffield United, most often PL slayers in the PL era. In the fourth round this year, at least two more Premier League clubs are certain to be dismissed after all-PL ties involving Southampton v Crystal Palace and Tottenham v Leicester. The other 11 Premier League cup hopefuls are all up against lower league opponents: seven from the Championship, three from League One (Bradford, Bristol City and Rochdale) and Cambridge United from League Two.